Back off and running. No changes. Blackburn team coming out. A few conversations going on between them and the Wolves subs. All seems fairly cordial. We did not get many ref decisions last year so I hope our luck has changed. I'm glad we're leading, but sounds like we really need to tidy up. Can't wait to see the replay of 'Edwards' goal. Greetings to all you Wolf chappie followers. I'm having a little break in Bermuda with my secretary - or "that woman" as my 4th wife calls her. I'm just enjoying a rum punch as an advance celebration of getting 3 points. Wolves lead at the break after a thrilling opening half at Ewood Park. 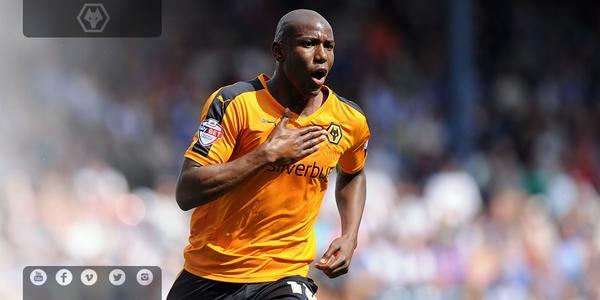 Afobe and Edwards on the scoresheet for the visitors. Interesting half then. What matters at the end of it is that we are 2-1 up. See you shortly. Are their league highlights anywhere other than Channel 5 tonight? Sounds more than a tad fortunate that but, hey, some go for you and some go against you. Glad this one went our way but we'll have to be careful with challenges around the box as the ref will be looking to square this one up. Methinks Edwards got away with that one ! ! Blackburn players having a pop at the ref as he comes off. Couple of suited security guys on hand although they seem to be leaving Grant Hanley to it to be fair. Hanley clatters into McDonald with his arm raised. Wolves man stays down. Ref does nothing. Except blow for half time. Quite a game. Stearman just geeing Ikeme up there. Good captaincy. 45' Dicko cuts inside on the angle of the Rovers box. He fires across goal where it's unclear if Edwards gets a touch. Raya can't keep out. started of slow....now we will show them! Worse case scenario we will only be 3 points off the top at the end of the day, i'd have taken that at the start of the season!! I'd get Ojo on at half time lads.